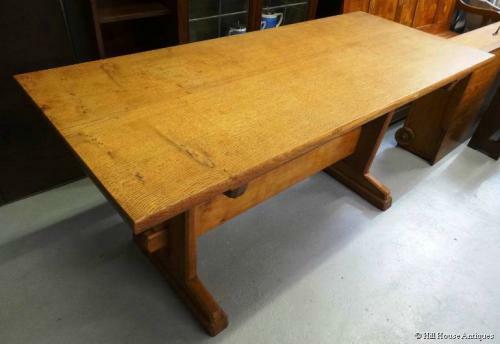 A very good solid golden oak Cotswold School refectory table on trestle base by the important Cotswold craftsman, Eric Sharpe (1888-1966); c1930`s/40`s. Fully monogrammed with his initials. Approx 60" long, 28.5" high and 25.5" wide. Eric Sharpe was originally a pupil of Arthur Romney Green in Hampshire for about eight years, and later became a designer craftsman working on his own (hence the extreme scarcity of his work), setting up his house & workshop, Thorn, at Martyr Worthy in Hampshire. Amongst his important commissions was the casket presented by The Corporation of London to the Prime Minister, Sir Winston Churchill in 1943.